Thank you for being here for Turning Heads Tuesday! Oh my gosh, I can’t tell you how stressed I was last week with the blog site going down. It was down all weekend and was going to take until Wednesday to restore! My data center and hosting site made mistakes and 1,000 sites were down, that they had to restore! I just don’t have a ton of patience with technology, but there was nothing I could do. Hubby is in IT and he made the transition easier when there were glitches Wed morning. Anyhooo.. hopefully no more problems for awhile! Let’s talk about LEOPARD LOVE! Here I am with an outfit my hubby shot before we were of to PA for a family visit. My nephews were getting their Eagle Scout badges and we would celebrate, along with visiting my hubby’s parents, who were 88 and almost 90. Good to see them! So I am in Harleysville PA until Thursday when we come home. I will have access to my computer so I will be by! Before I go into my leopard dress, I want to show you the post i HAD INTENDED for last Tuesday. I am now collaborating again this Fall with Jambu, as a Brand Ambassador, as I really love their style and comfort! Where were they when I was a teacher ?? Just a peek at last Friday’s post on the Miranda, a shoe- bootie with some old world charm. Low heel and memory foam. So stop by if you get a chance and read the post. READERS OF EDS WILL GET 20% OFF USING CODE JESS20! I’ve been a bit on a leopard kick lately. Yesterday’s post began with some leopard booties and a thin leopard sweater. Now there is Liberty Avenue leopard ( Pittsburgh reference) and there is classy leopard. I think you might get my drift. When I saw this dress on Zara, I knew it would become part of my wardrobe, as I see it as a year round dress. I will tell you certain ways I would wear this dress, as there are a many styling options! The key for me purchasing an item, is “do I love it”? and “how many ways can I wear this outfit with what I have in my closet?’ When I first saw this on Zara, I loved it, but didn’t jump the gun. I would go back and look at it, longingly. Then, when i saw Emma wear this dress, i thought, you have to buy it! She looks great in it ! Yes, I was influenced, but in a good way! This is going to be a fun dress to wear different ways. As I am wearing it today. Just a long midi dress with a bit of color from my purse. I added another leopard print and fishnets to the look to create texture and print. Belted and with boots/booties. I need a beautiful brown leather belt. I prefer this over the cloth belts that come with the dresses. I would wear a leather belt with the dress and add a cute pair of block heeled booties or a pair of knee high boots. Open with a slip dress and booties. Slip dresses are great for layering. A lovely silky slip dress underneath this dress left open would look beautiful. This outfit was easy to come together. I knew I wanted to mix leopard prints, so I wore my Rockport Total Motion pumps, added a fun pair of fishnet socks and the leopard dress. You could certainly stick to an all neutral palette, but I decided to add just a bit of color with my floral circle bag. The magenta petals of the flowers really went well with the flowers in the background. We were near Cork and Cask, another favorite place, where you get comfortable knowing everyone and the wine, food is delicious. My photographer has to eat! See how my hubby caught the colors in the floral pattern of the bag and how the magenta flowers match the background? THANK YOU ALL FOR YOUR SUPPORT, YOUR COMMENTS. THEY REALLY MAKE MY DAY! 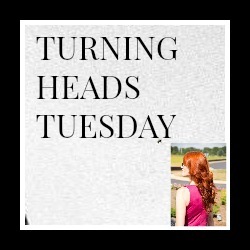 PLEASE COMMENT ON OTHER BLOGGERS AT THE TURNING HEADS LINKUP. ITS GOOD LINKUP ETIQUETTE! i’LL BE BACK WITH BLOG FEATURES NEXT WEEK! IT troubles are the worst! You are lucky that your husband is in IT. Both me and my hubby are useless. Yesterday I spent the entire day first trying to fix my printer and then I had to go out and buy a new one only to spend another 3 hours trying to get the new one to work. UGH! Love the leopard. It is really trending again right now. Oh I can imagine how stressful it was having site troubles! Glad things are up and running again. I love the leopard dress, so on trend! LOVE the leopard print shoes with fishnet socks Jess!! Well you know how much I love leopard Jess, and that dress is so perfect for you. I absolutely love how you paired the black and red round handbag with it. GREAT MIX! It really proves that leopard is a neutral! Thank you for the link up!! You know that love those Jambu booties! And the color in that top – fabulous! Oh no, I’m sorry your site went down—that’s like my worst nightmare! But glad you are back up and running, and I am loving your leopard-print maxi dress. I am totally on board with the leopard trend too! Love this dress on you and the socks are too cute. Enjoy October. Jess, those Jambu booties are gorgeous! But this dress is an absolute show stealer! Wow, my friend, just wow. You look spectacular! And I love that you went with fish net ankle socks and more leopard on your feet. So great. Hi Jess! I’m so sorry about all of your technology struggles! I can’t even imagine how hard that would be to go through! I love both outfits and the leopard shoes are absolutely adorable! Hope you’re having a great time with your nephews! I know you’re so proud of them! I am glad your blog is up and running again! You found a wonderful dress from Zara! This is a bold and fantastic look and I love it! My blog was acting up last week, too! It was the worst! Thankfully my husband got it fixed, he works with computers… but, it took even him awhile to figure it out. That dress is so pretty, I am really seeing more and more leopard in outfits and not just the accessories. OHHH, I love those fish nets paired with the leopard shoes, too!! Oh, Jess, how horrible are tech woes! Littler things than that drive me crazy! So glad you are back in business. Love this outfit and the way you styled it. Your husband took a perfect shot of the bag with the flowers! Have fun in PA.
I’m loving the leopard on leopard! Those sock fishnets are so much fun! I love leopard print!! This dress is so gorgeous, and I love your fishnets! Girl…you are being bold with the leopard and I LOVE it!! Site issues are the WORST and so stressful. My site was having server issues since Thursday, and no one could get on unless they hit the refresh button a few times. NOT OK!! I shed a few tears, not gonna lie! Glad to see your all up and running, and in the cutest dress, no less! You have such a beautiful and unique style. I love it. This dress with those fish net socks and shoes. Fabulous! I can’t tell you how much I *adore* both outfits! I’m somehow going to implement fishnets and leopard. The lace tank over the long sleeved top is simple, yet ingenious. I’d copy your colors in a heartbeat. I’m so glad your tech is back on board. I think we can all relate to how frustrating those problems can be. So happy your up and running again. That leopard print dress is so amazing! Lady in Leooard, you ROCK! Oh how I love that dress! Jess, you did this so well! I love the fishnets with your heels and the leopard dress! Looking great my friend! Ugh, website problems are the worst! I get SO stressed anytime my site goes down. So glad yours is back. I love how adventurous this outfit is! So happy your blogging woes are over! Love the Leopard Dress! Funny, today’s prompt for October is a shirt dress and I agree about it’s versatility and wearing it as a duster. I am so glad that everything is back and in working order. Technology, a blessing and a curse, right? Leopard is a classic piece! I see it every year and I just can’t get enough! There’s nothing so bold yet so neutral. How is that even possible? Love this leopard dress and that necklace is beautiful! This outfit is absolutely fabulous from head to toe. There are so many interesting ways and useful tips on how to wear this dress, Jess. The fishnet socks are just adorable. Glad to see that all has been resolved on the technical side . That leopard dress looks wonderful, cant beat leopard , its always a classic in my book. Enjoy your family time. Many thanks for hosting Jess. Wow! I always look forward to see your outfits, but I sure do love this! Fan tas tic!